Creating bead jewelry art since 1993, Priscilla Beadle first found inspiration for her bold, eclectic designs in the bazaars of Tibet and Nepal, in dusty shops in Beijing, on remote Indonesian islands reached by catamaran, in beautiful Bali, and in verdant Indochina—Laos, Cambodia, and Vietnam. Today Priscilla has narrowed her focus to four categories of neck adornment including nature, whimsy, Venetian and other glass, and semi-precious stone. Each Beadleful design starts with a centerpiece bead—add whimsy, color excitement, texture, chunky beads, a fabulous clasp—a collectable necklace is born. With environmental awareness, Priscilla selects sustainable materials from nature. Some of her pendants include petrified wood, beetle wings, paua shell, and mother of pearl (nacre). Beads may be made of amber, Philippine seashells, cork, apricot shells, carved wood, tagua nuts, cultured pearls, and seashells. Whimsy and a sense of playfulness, joy in her craft, are present in all of Priscilla’s necklaces. 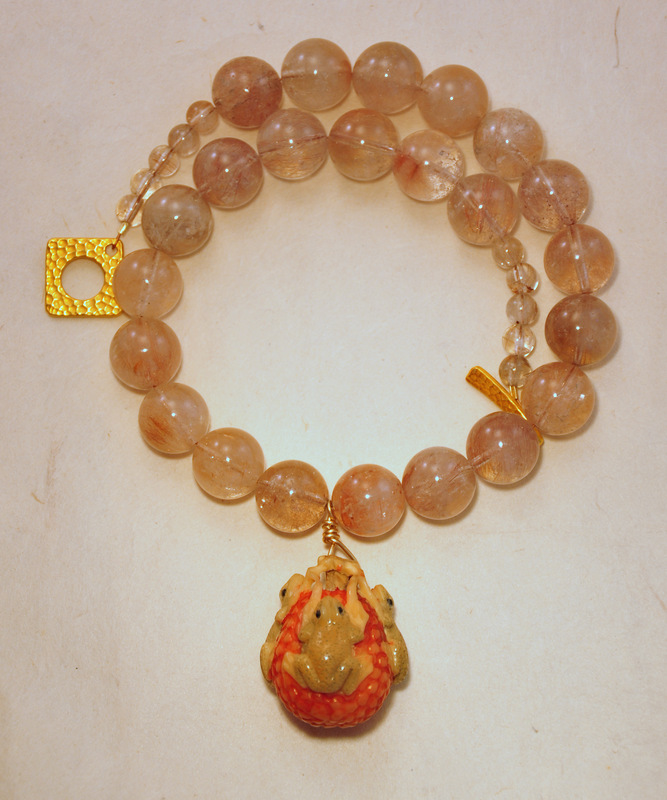 In particular, some pendants feature animals such as a koi carved from resin to look like coral; an artisan-created glass cylinder adorned with a green glass gecko; a netsuke featuring tiny frogs. Some neck pieces feature amulets: an Italian red cornicello topped with a bit of rabbit’s fur; a carved bone Buddhist goddess of mercy; a lucky sterling silver star; turquoise, believed to protect the wearer from falling. Neck pieces in this unconventional group include materials such as vintage acrylic beads; dyed large teardrop pearls; handmade intricate beads of cardboard; resin combined with mother of pearl and carved into beads; polymer clay beads. Sometimes these necklaces feature an asymmetrical layout or an ornate clasp. On several trips to Venice, Italy, Priscilla has collected an assortment of the finest glass beads in the world; those made on the island of Murano, home of the Venetian glass industry since the 1300’s. For centuries, Venetian artisans have been perfecting their decorative techniques, controlling the color and transparency of glass beads. A particular favorite of Priscilla’s are lamp-work beads where each bead is created individually. In this time consuming method, the artist uses a torch to melt together Murano glass rods and tubes and wrap them around a metal rod to fashion the desired shape. Special effects are achieved by layering different colors of glass in addition to gold or silver leaf. The hole left in the cooled bead from the metal rod is perfect for stringing. Priscilla has found a few local artists who have perfected this technique. Semi-precious stones feature in Priscilla’s work; in particular, bluish green and sky blue turquoise; sacred iridescent moonstone; biblical carnelian, one of the “stones of fire” with their reddish orange hue; jade, “stone of heaven” for its unearthly shades of green; uncommon amazonite with its blue-green color; rutile quartz, also known as “Venus’ Hair” for its golden strands of crystal in a clear quartz; unakite, whorled with pistachio green and salmon pink; yellow to red sunstone with its glittering copper flecks; warm golden amber, fossilized tree resin between 5 to 50 million years old; crystal clear magnesite; and agate, also a biblical “stone of fire” valued since ancient times for the beautiful flowing patterns seen in its many colors. Priscilla Beadle returned to her hometown, Hull, in 2011, after residing for — years in San Luis Obispo, CA. She brought her business, Beadleful, with her and crafted a comfortable studio for her work on the ground floor of her home. The spark of Beadleful ignited when, after 23 years in the corporate world, Priscilla retired in 1993 to accompany her husband on his job assignment in Hong Kong. Southeast Asia became her handicraft fantasy world as she hunted for beads: odd, large, ethnic, contrarian beads; antique or contemporary glass beads; rare and unusual colors; textures that lead to touching. Whether traveling the world or stalking New England galleries, successful bead hunting inspires the bold eclectic designs that characterize Priscilla’s unique necklaces and bracelets. For more information or to arrange a studio tour, please contact 781-925-0484.